Cockington village, a well-known showplace 1 mile from the centre of Torquay, is picturesque with thatched, white walled cottages, and an old forge. Cockington is located in the grounds of Cockington Court this thatched village is popular with tourists. 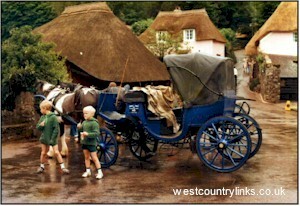 A relaxing way to visit the village is to take a horse drawn carriage ride from Torquay. Torquay, like so many other popular resorts on this coast, has a traffic problem, and parking restrictions in streets near the beaches and harbour.